The Rosalind Franklin STEM Ambassadors Workshop was held on 10-11 September. The workshop was focused on GCSE age girls from backgrounds currently underrepresented in STEM careers. It was designed to encourage and inspire the girls, and to equip them with a host of gatekeeper skills that would enhance their chances of attending a top university in the future. 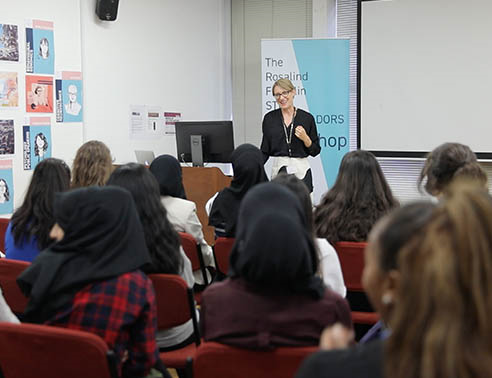 The workshop was Professor Essi Viding's (UCL Psychology and Language Sciences) 2017 Royal Society Rosalind Franklin Award Project to promote women in science. UCL Widening Participation office provided expertise to support the project. The workshop introduced varied science career options and provided an opportunity to meet leading female scientists on diverse career pathways, including the organizer Professor Essi Viding (UCL PaLS), Professor Ijeoma Uchegbu (UCL School of Pharmacy), Professor Dame Uta Frith (UCL Institute of Cognitive Neuroscience), Professor Sunetra Gupta (Oxford University Zoology), Dr. Emma Meaburn (Birkbeck Genetics), and Dr. Laura Boothman (Senior Policy Manager at Arthritis Research UK). The scientists talked about their research and paths into science. Their talks were followed by small group sessions where the students interviewed the scientists. The students also received confidence and public speaking training provided by the Director of TEDXLondon, Maryam Pasha. Dr. Tessa Dekker of UCL Institute of Ophthalmology gave the students a VIP tour of Birkbeck-UCL Centre for Neuroimaging where they watched a live demonstration of a brain scan. Professor Essi Viding led a session on scientific method and writing and provided an informational session on how to prepare for university applications. The students will be matched with mentors who will support them as they progress through their GCSEs, A-levels and university application process. At the end of the workshop, the students gave group presentations on their experience at the two-day workshop. The concluding event took place at the Gustave Tuck Lecture Theatre, to an audience of family members, teachers, Professor Viding's research group, and several of the featured speakers. For most of the participating girls, this was the first time they had presented to a large audience. They were confident, clear and engaging and brimmed with enthusiasm for science and for what they had learned during the workshop. The feedback following the workshop from the participating students, their parents and their teachers was uniformly positive. The girls reported that the workshop had improved their confidence and expanded their horizons regarding future study. Parents and teachers were equally enthusiastic about the impact of the workshop. Digital content created during the workshop will be shared on the web resource - to aid each girl in sharing her experience with her peers as a STEM Ambassador. A web resource based on the project, free to use for schools across the country, will be launched in January 2019.